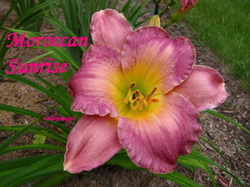 6.5" rich pink blend with white mid-ribs and lighter pink sepals and a green throat. 6" fragrant bicolor; light lemon yellow sepals, red petals with creamy white midribs. The original Magic Dawn is hybridized by D.F. Hall and is a rosy red self. The daylily I have also is called Magic Dawn, and many people and companies have this same one, but I am not sure who the hybridizer of mine is. 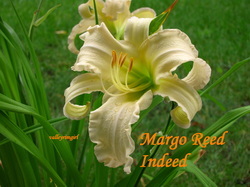 7.5" cream white with pink undertones & small ruffled white edge above chartreuse throat. Awards: Honorable Mention 2007, Award of Merit 2010, the Lambert Webster Award for the most outstanding unusual form daylily in 2011. Look at the diamond dusting on each leaf! 8.5" medium yellow spider with purple eyezone above green throat. Spider ratio 5.31:1. 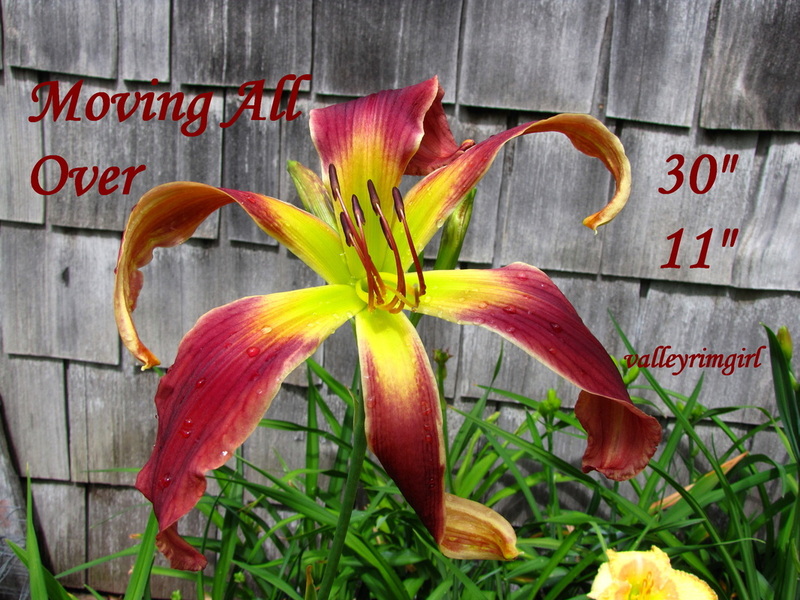 Awards: Honorable Mention 1999, Harris Olsen Spider Award for the most outstanding spider or spider variant in 2000, Award Of Merit 2003, Don C. Stevens Award for the most outstanding eyed or banded daylily in 2005. 5.5" deep rose pink blend with large chalky peach eye & yellow green throat. 5.25" acacia yellow with merlot eye and edge above gold to green throat. 6" lavender with small golden edge above cream to green throat. 11" UFO crispate purple self above deep green throat.